Bowlers battle on despite the poor weather! What terrible weather we have had over the past two months! It certainly has put the damper on many a match at Coral Bay with competition bouts being postponed and friendly matches with our yearly visitors having to be cancelled. Fortunately our Competitions Secretary has been generous by allowing quarter final ties to be played up to March 10th. Hopefully the rain will go away and leave us with some bright sunny days. The loneliness of the rained off bowler! Coming up in March we will be playing fourteen matches against bowling teams visiting Paphos from the UK. 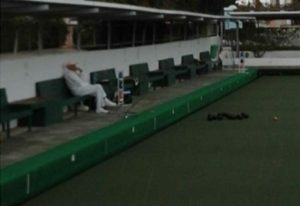 These visits are ongoing every year as many bowlers take advantage of the good weather (usually!) at this time of year and they get the opportunity to bowl outdoors in the sunshine- something often denied them in the UK even in the Summer! On March 25th we will also be visited by a team from “up North” as members of the Olive Press Bowls Club in Lapta, near Kyrenia, will travel south to compete for the Olive Press Trophy against Coral Bay members. This has become a twice yearly event with Coral Bay members travelling to Lapta for a return match usually during May. We are getting the orange ribbons ready! Come along and watch some good bowling at our club; enjoy a drink on the balcony while you watch and you never know you might be tempted to have a go! See us at Neo’s Sports Bar & Restaurant in Peyia. call 97815979 for more information.